PREMIUM GROUP is a family business group founded in the Sixties by Lalaji Shri Omprakash Somnath Murgai and his legacy is carried forward by his sons and grandsons. The Premium group of companies is just like a family having a very strong value system. With the blessings of Lalaji Shri Omprakash S. Murgai, his sons and grandchildren have carried the legacy of the group, surging it forward with immense hard work, dedication and traditional values with the support of our committed team of professionals. We are a Food and Agricultural Produce Enterprise dealing in all kind of food and agricultural commodities. If India produces it, we can get it for you. We have a reputed long market standing and enjoy a long lasting relationship with our customers. 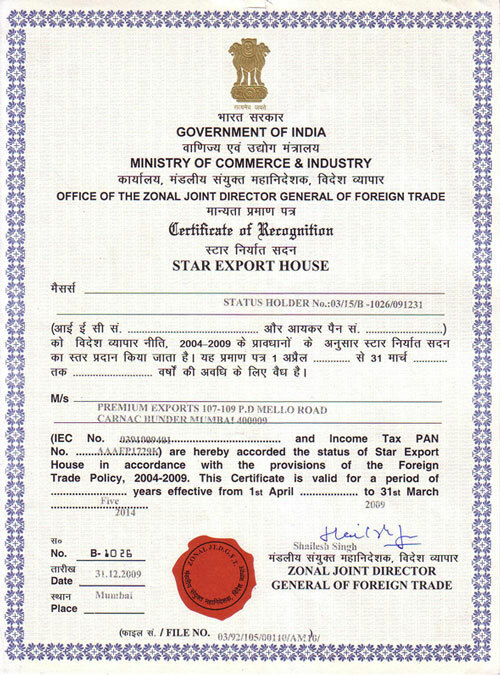 PREMIUM EXPORTS is a Government Recognized Star Export House dealing in the import-export of all kinds of Food and Agricultural Commodities. The company was established in the year 1988 and is growing stronger every year. We offer a wide range of foods and commodities like Sugar, Rice, Wheat and Allied Products, Oilseeds, Spices, Pulses, Cattle/ Bird Feeds, Cotton, Frozen/ Fresh Foods and Ready to Eat Foods. Our major clientele are from Afghanistan, Canada, Germany, Indonesia, Iran, Kuwait, Malaysia, Pakistan, Philippines, Poland, Saudi Arabia, Singapore, Sri Lanka, Taiwan, Turkey, U.A.E. and Vietnam. Quality products and prompt shipments are our forte. We believe in long term relationships and our esteemed clientele is proof enough of our fair and sincere dealings. We are optimistic that if and when we have an opportunity to do business with your good selves, you will be more than satisfied with our sincere efforts towards providing quality products and timely shipment. We look forward to serve you as a valued customer. PREMIUM EXPORTS has an immaculate track record with regards to Quality and in fact is listed as an approved supplier of Yellow Maize by the Government of Taiwan. We believe a ‘Quality Product’ can face the test of any kind of market scenario and fetch a premium, giving our customers more profits. We take immense pride in the Quality of Goods we supply and source the best available Quality with lot of perseverance and with the help of latest technology. Customer Satisfaction through the delivery of Quality Goods and prompt Services is our motto.